Announcement: Registration for the 2019 Zero Robotics Middle School summer competition opens soon! The 10th annual Zero Robotics High School Finals took place January 27 onboard the International Space Station. 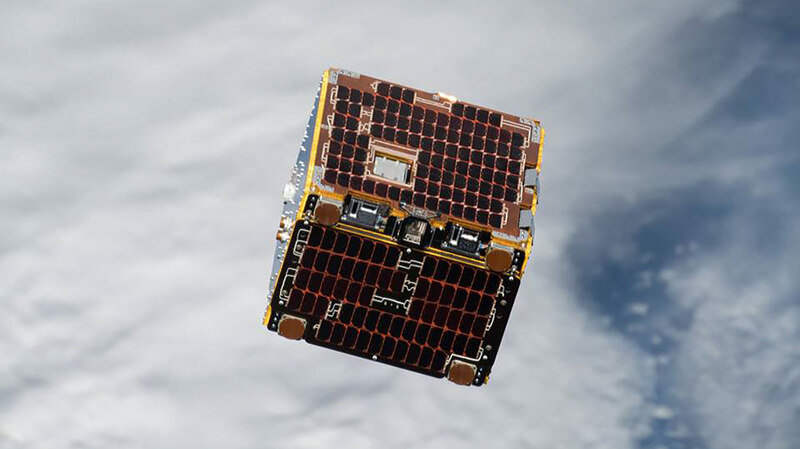 Students from three countries uploaded their code to the ISS and watched a live webcast of Synchronized Position, Hold, Engage, Reorient Experimental Satellites (SPHERES) robots carrying out their programs in microgravity. This year’s challenge required the robots to attempt “hooking in space,” in the words of Dr. Alvar Saenz-Otero, who leads the Zero Robotics project and directs the MIT Space Systems Laboratory. The on-station referees for the tournament were NASA astronaut Anne McClain and Russian cosmonaut Oleg Kononenko. SPHERES are floating soccer-ball-sized robots propelled by puffs of gas from small carbon dioxide canisters. Since they first got to the ISS in 2006, crew members have used SPHERES in more than 100 investigations. Some experiments use individual robots and some use multiple robots operating in sync. This year’s Zero Robotics competition was the first experiment in which one robot attempted to hook and tow another robot. 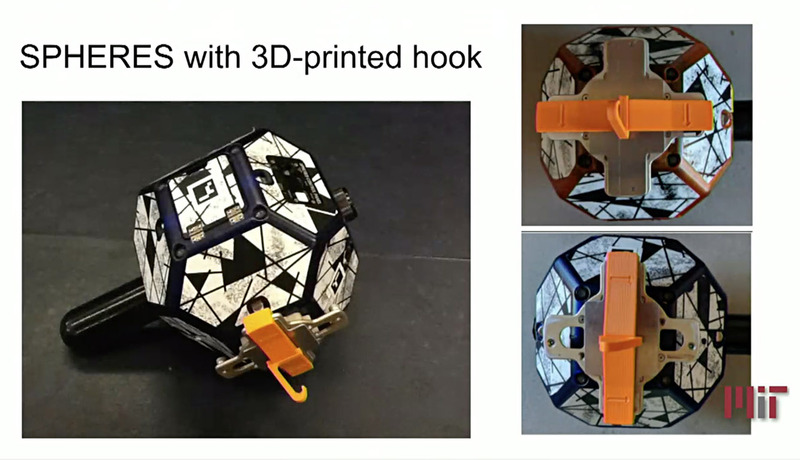 The robots were fitted with customized plastic hooks designed at MIT and 3D-printed onboard the ISS using the Made in Space Additive Manufacturing Facility! Installed on the ISS in 2013, this microgravity 3D printer has proven useful for producing custom components that the crew can use immediately. The custom plastic hooks were manufactured by the microgravity 3D printer onboard the ISS. Apart from the net approach, debris can be removed by attaching to it and dragging it to a new location. That is the idea behind the hook-and-tow challenge in the competition. The setup for this year’s challenge started with a mock distress call. The Red SPHERES Satellite is in trouble. It has been damaged by debris and we need to retrieve it. The mission ahead of us is dangerous. 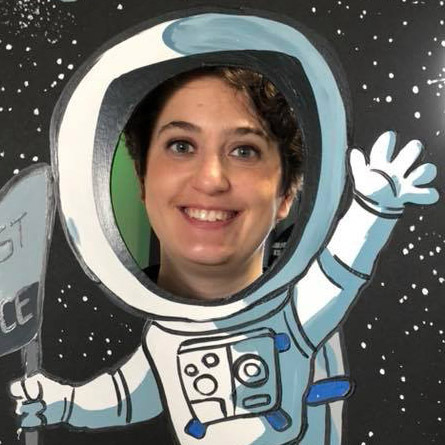 To protect important [satellite-based] research, the SPHERES program is working with the international Evade, Capture, de­Orbit (ECO) initiative to identify and remove space debris from Low Earth Orbit (LEO). The ECO­SPHERES design includes a hook for the SPHERES to tow any type of cargo. Program your satellite to avoid debris while trying to locate the damaged red SPHERES. Use expert geometry to latch onto the damaged satellite and return it to safety, taking into account the momentum of your precious cargo to prevent further damage. Good luck to all participating space engineers. This year’s challenge was extremely difficult. The students cannot control the SPHERES by remote control the way a hobbyist flies a drone quadcopter. The SPHERES carry out pre-programmed movements with limited ability to respond to unexpected changes. The programming all comes down to geometry and math. The target was the red SPHERES robot, which floated helplessly in midair because debris has damaged its thrusters. The slightest bump would send it gliding away with no ability to correct its course. The pre-programmed player robot had to approach the target from a distance, slow down at exactly the right time, rotate to align the hooks, and then change direction to tow the target toward the safe zone. Adding to the difficulty were dozens of impossible-to-control factors such as imperfect CO2 pressure in the SPHERES’ thrusters and variations in air currents within the station! It’s not surprising that the real-life robots on the ISS didn’t behave quite the same as the virtual ones in the simulations. Anne McClain and Oleg Kononenko look on as the blue SPHERES attempts a hooking maneuver with the red SPHERES. In the face of these daunting challenges, the students’ performance was exceptional. The teams were well prepared, having honed their programs through many iterations. Every team achieved hook-to-hook contact during at least one round. Two teams succeeded in hooking and towing the target robot! The two winning alliances were groups of American and Italian students. First place went to Naughty Dark Spaghetti and second place went to Hit or Miss. Zero Robotics has had an outstanding decade, totaling 20,000 students and more than 4,500 educators so far. Congratulations to all the organizers, mentors, competitors, and supporters! Enjoy presentations by guest scientists and astronauts. 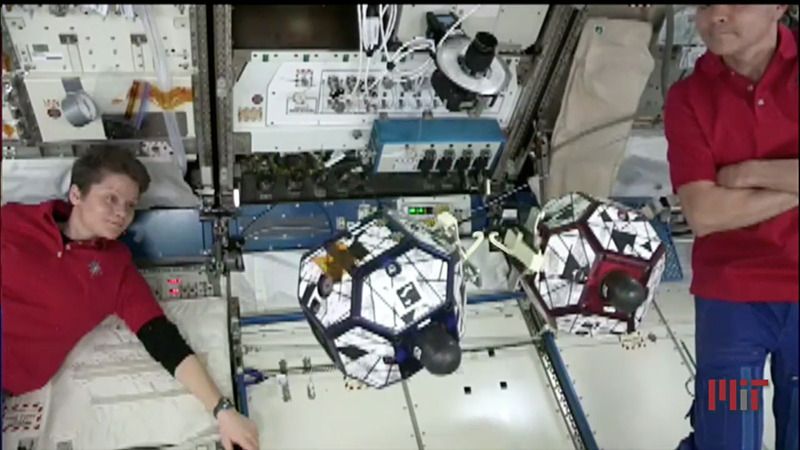 Then watch ISS crew members Anne McClain and Oleg Kononenko act as referees as the SPHERES carry out the students’ programs. 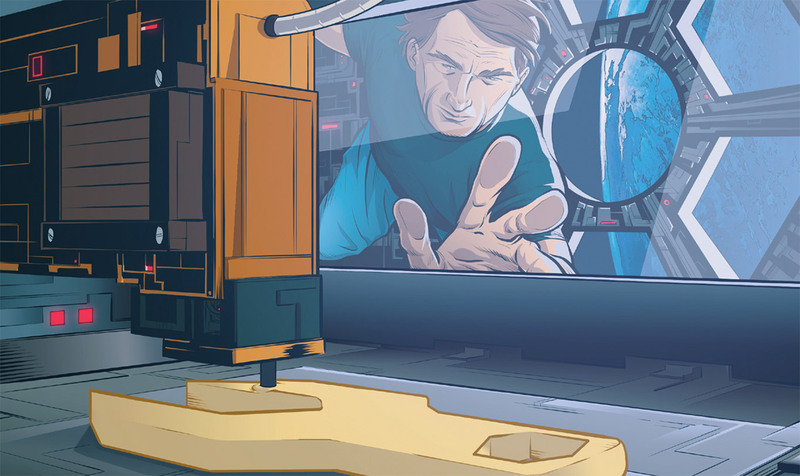 Made in Space joined forces with the ISS National Lab and NASA to pave the way to 3D printing in space. Article in Upward (the magazine of the ISS National Lab) about the Made in Space Additive Manufacturing Facility. Video from National Geographic’s Short Film Showcase.